Your adventure tour begins as you are picked up from your hotel in Los Cabos or the cruise ship port. Board a vehicle and head to the G-Force Adventures Park where you will be able to visit rare white lions before the start of the tour. Then, you can pick your top-of-the-line UTV (commander) and get your equipment including helmet and goggles. You will receive a safety briefing and instructions and then it's off to begin your great UTV tour in Los Cabos, Mexico. Your expert guide will take you into the Baja desert as you drive through narrow riverbeds which will lead you up to beautiful Margaritas Beach. See different plants and admire the incredible views and contrast between the white sand, desert and blue ocean. 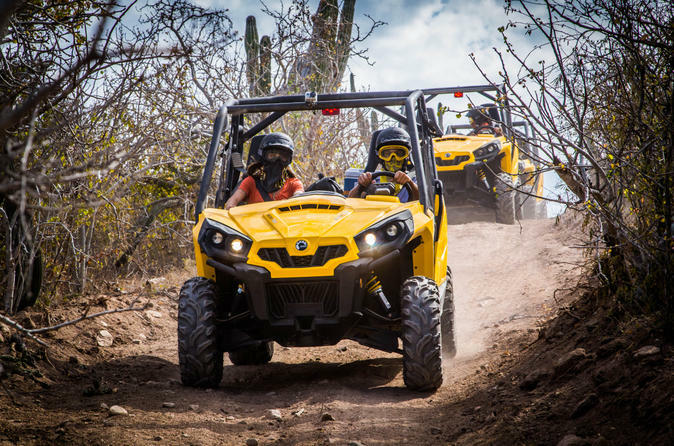 This tour will give you the chance to drive your own UTV and explore the outdoors of Cabo San Lucas in an adventurous way. The tour is guided all throughout and no previous experience is required. After your tour, you will be taken back to your hotel. If you enjoy riding UTV's i recommend this adventure through the hills near Cabo. Spectacular views of the Pacific Ocean, beaches, flowers, large cactus . Our tour guide stopped along the way to let us taste the Cactus fruit, Pataya. It was very good, kind of taste like a melon. Some of the Cactus were 20 feet tall. The lions at the compound were adorable. Great tour..